The Dock Street Theater, located on Church Street is another historic building that Charleston South Carolina, is so proud of having. After completing a major renovation this building is a work of art. The columns are unique and different like no other, the building has a rustic theme to it, and ads background quality to any image photographed there. Being a Bridal Photographer in Charleston SC, this bride drove from Columbia Sc to have her bridal portrait capture here. We had a great session in particular she had such an amazing dress and we had so much fun photographing her in many different parts of Charleston. This images says it all, instead of just posing there, I asked her to keep twirling her dress from side to side, and finally after a couple of photograph, I got the perfect capture. 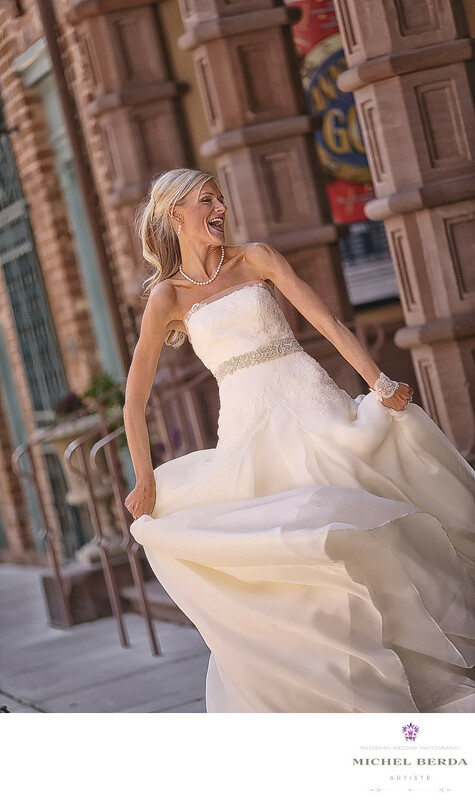 Here she is with a great laugh twirling around, a tilt to the camera adds to the drama, the couple of columns from the Dock Street Theater and the green gates in the back adds all of the elements of this great bridal portrait. Keywords: Bridal Portrait (84), Bridal Portrait Photographer (84), Charleston (1179), Church street (18), sc (309), The Dock Street Theater (6), Wedding Photographer (1254).